ABOARD THE AMPHIBIOUS ASSAULT SHIP WASP -– If you’re going to watch your favorite NFL team lose in the Super Bowl, it may as well be somewhere interesting. That’s the scenario I found myself in last night as I continue to cover Bold Alligator 2012, a massive amphibious exercise involving at least 14,000 personnel and 25 ships off the coast of North Carolina and Virginia. Like many of the sailors and Marines aboard this gator ship, I had accepted there was a strong possibility the game wouldn’t be on while underway –- only to find out the exact opposite. Not only did the Wasp have the Super Bowl, the ship’s leadership went out of its way to make sure as many people as possible could see it. From the wardroom, to the barber shop, to the mess deck, several thousand personnel took a break to watch the game, in which the New York Giants beat the New England Patriots, 21-17. The liveliest place to view the game was the hangar bay. 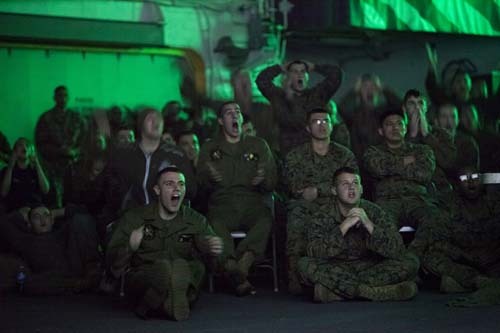 A movie theater screen and hundreds of chairs were set up, and Marines and sailors turned it into a concert-like environment in which the game and the commercials alike received howling cheers and boos. The crowd was polarized when it came to sports, with any close-up shot of Patriots quarterback Tom Brady or Giants quarterback Eli Manning receiving a loud, mixed response. It was less so when it came to the commercials, as the raucous response to a new ad for the Fiat 500 Abarth showed. It depicted a tall, exotic woman flirting with a short, awkward man – until he realized he was simply daydreaming. The Marines and sailors howled. In the ward room, dozens of officers aboard gathered over chicken wings, mozzarella sticks, coffee and soda to watch the game on two big-screen TVs. 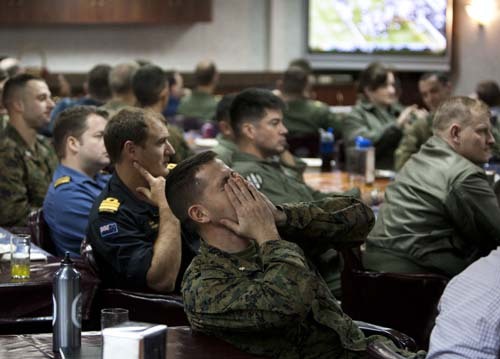 Several foreign officers asked questions about the rules of American football, and U.S. personnel cheerfully explained. As a Massachusetts native, I took all this in with a red Patriots T-shirt poking out from underneath my half-zipped fleece. A few people noticed, but no one poked fun. They understood the draw of the game. In the hangar bay, Lance Cpl. T.J. Miller, 20, told me he found out he’d be involved in Bold Alligator two days before the ships launched earlier this month. A Patriots fan, he assumed he’d miss the game for the second year in a row. Ah, the signal. Late in the game, it did go out again. Shortly after Giants receiver Mario Manningham reeled in a spectacular sideline grab that put New York in position to win the game, the screens on board went dark. “Are you kidding me!” several Marines and sailors yelled in the mess deck, frustrated with the timing. The signal came back a few moments later, and stayed true through the end of the game. When Giants running back fell into the end zone with the game-winning score with about a minute to play, much of the hanger bay exploded into cheers. Brady’s last desperation heave into the endzone fell to the ground a few minutes later, and Giants fans on board erupted. A sailor began blowing a whistle as though it were a musical instrument, and a group of Marines and sailors began jumping up and down in celebration. Lance Cpl. Alex Ovide, 23, was one of the most boisterous. An amphibious assault vehicle crewman from Queens, N.Y., he’ll be involved in the amphibious unfolding over the next few days, but was glad to watch the game. He missed it last year while he was in the field, he said, and didn’t know the Wasp would have the game until it was already underway. The result of the game, Ovide said, was “simply beautiful.” He congratulated the Patriots on a great season, knowing that I was a fan. I couldn’t agree more. Other than the final score, of course.